Can you believe it’s April? 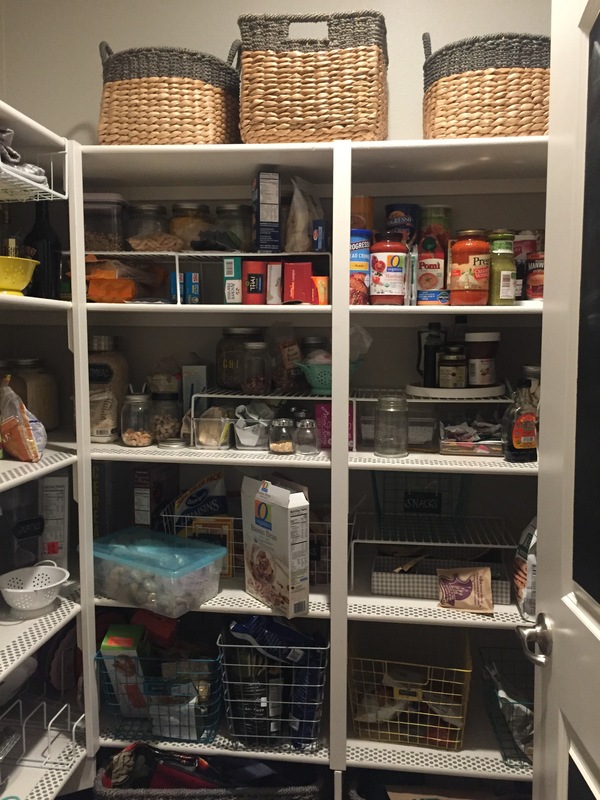 I’ve been on a decluttering kick, and just finished a pantry reorganization that has basically changed my life. This was my second attempt, and this time I got it right, so I thought I would share a few tips and tricks that I learned along the way. 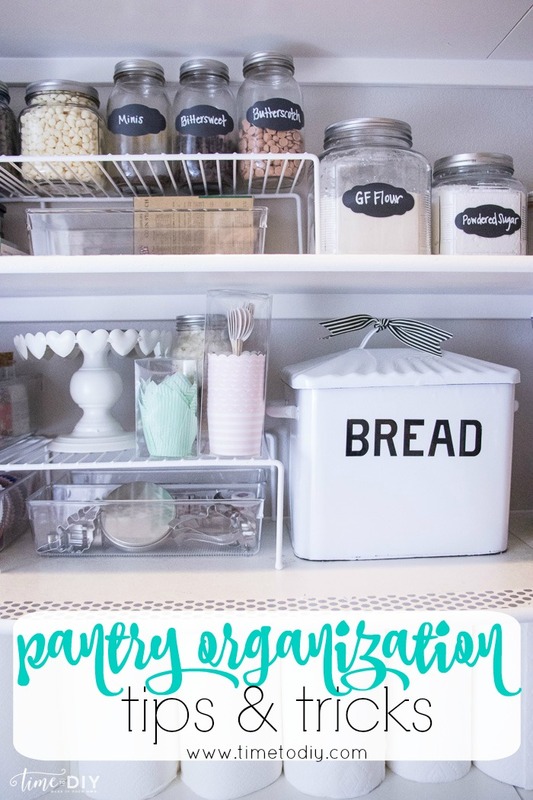 And if you’re looking for some bins and organizational goodies, I’ve sourced all my favorites at the end of the post. So this time I got serious and cut deep. I got down to the basics and only kept food that I knew we would actually eat. 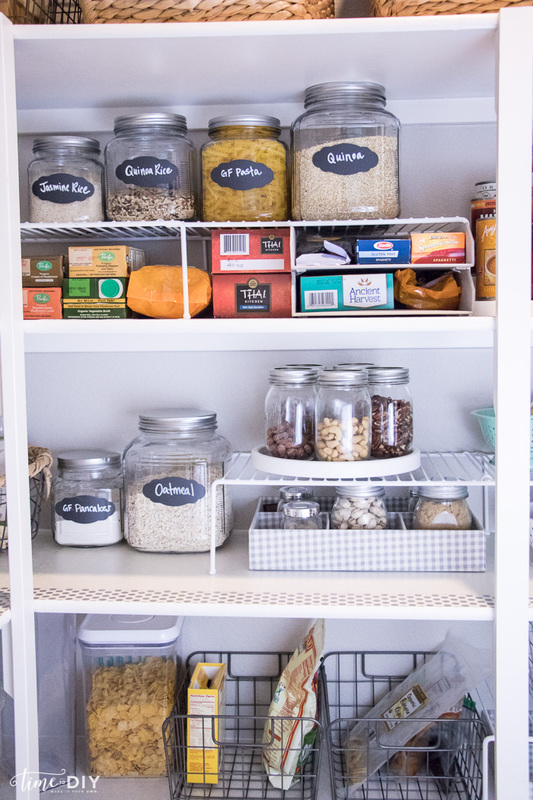 I store decor and cooking appliances in my pantry as well, and I did the “spark joy” test – if it wasn’t meaningful, in the “love” category, or used in a year, it went to the donation pile. In the end I got rid of 17 bags that went to our church food pantry, donation and trash, and I felt 100 pounds lighter. I was amazed at how many things I had saved over the years, and moved multiple times, but never used. 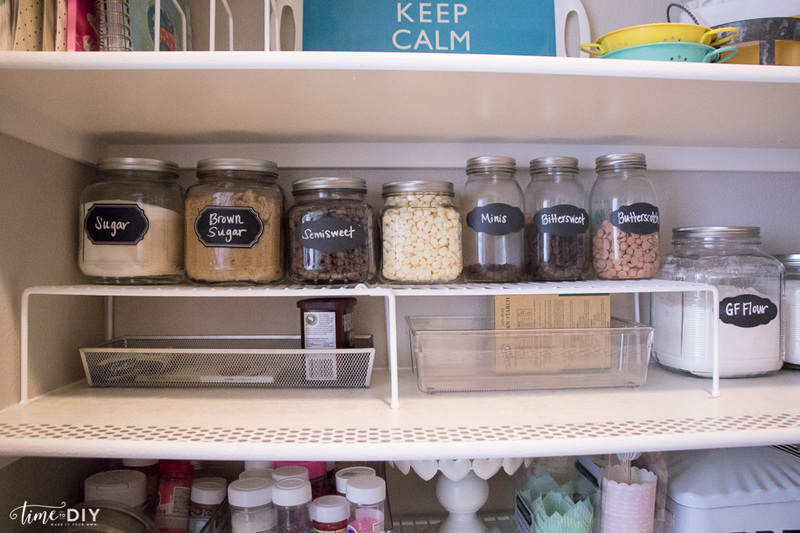 The best part is that it’s been a month and my pantry is still organized, which is a record. After simplifying, it’s been so much easier to keep it tidy. 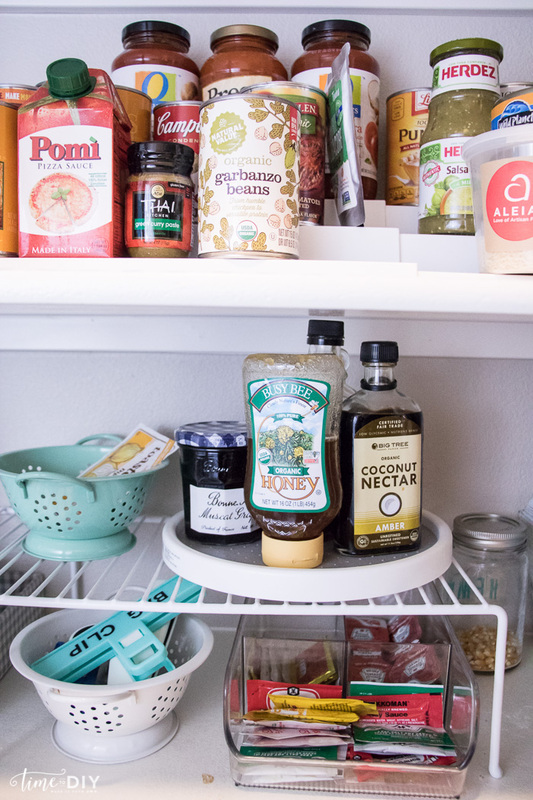 One way to declutter is to remove everything from your pantry, and that’s a good time to add some flair to your shelves, if you want. 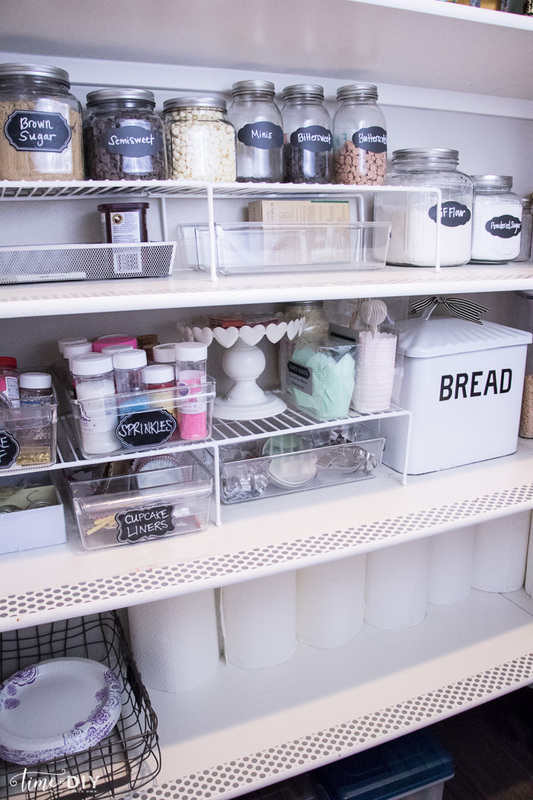 I lined my shelves with clear adhesive liner and added some Heidi Swapp thick washi tape. 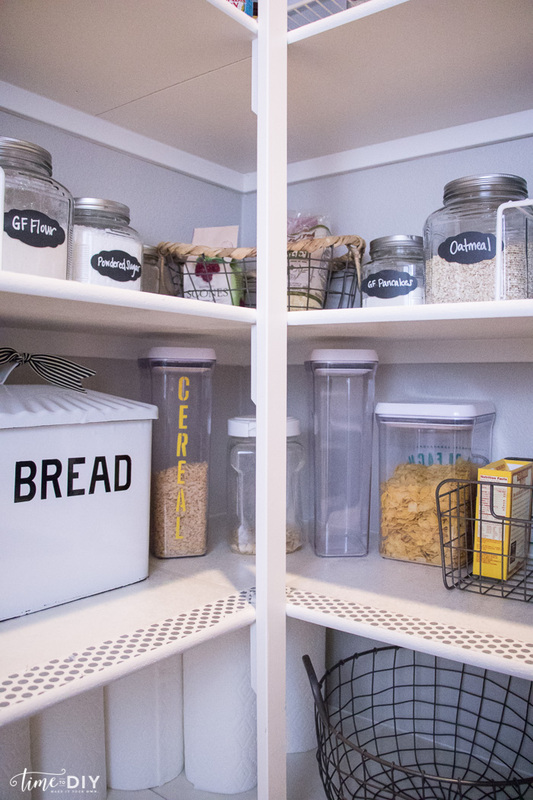 Once you’re down to the basics, group everything to see what kind of containers and shelves you might need. 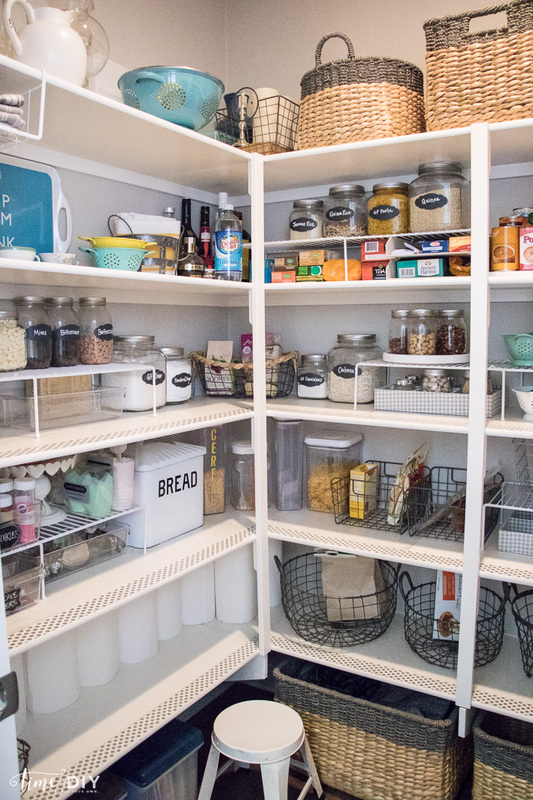 I grouped by baking, dry goods, canned, snacks, breakfast, and condiments. 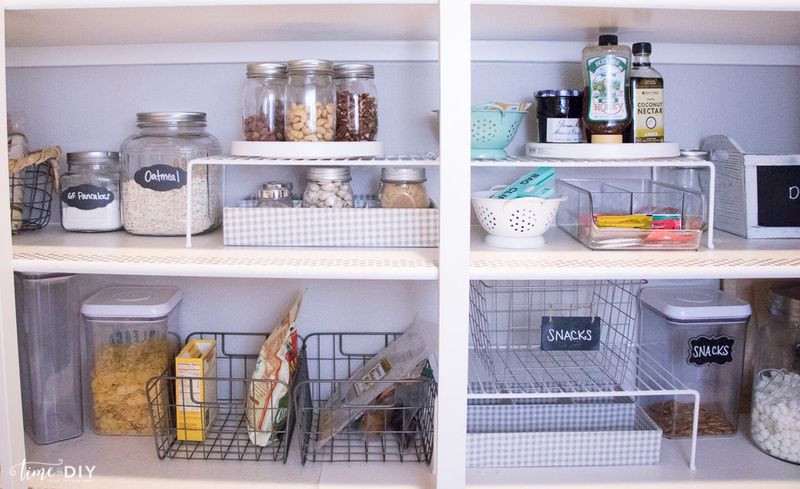 Get rid of those cereal boxes and annoying chocolate chip bags and contain everything in jars and bins. I still have some snacks in bags, but it feels much more organized and less cluttered when it’s in a bin. 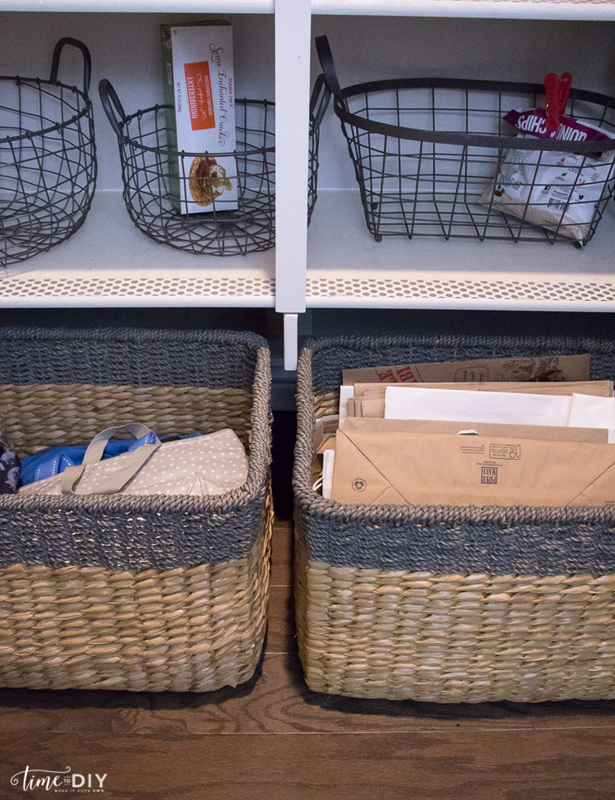 You can tell we needed to go to the grocery store – There is usually more in those bins, lol. 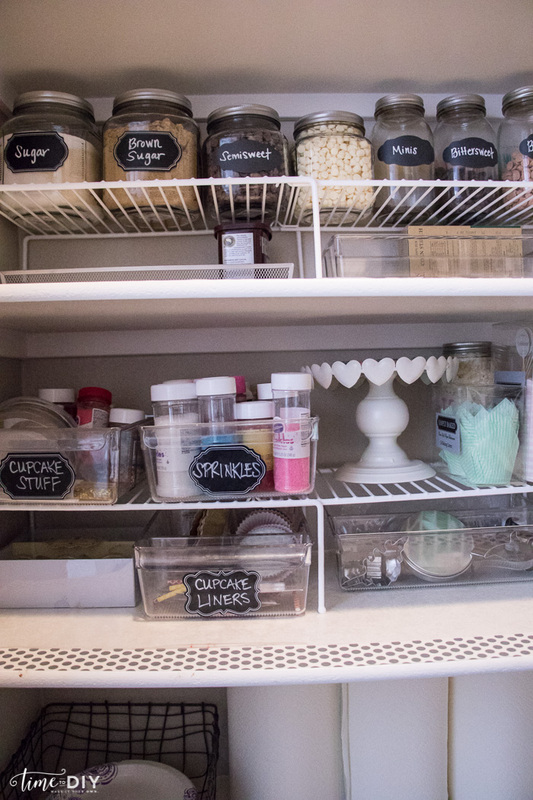 I love pretty labels, but my preferred pantry label is a chalkboard label. 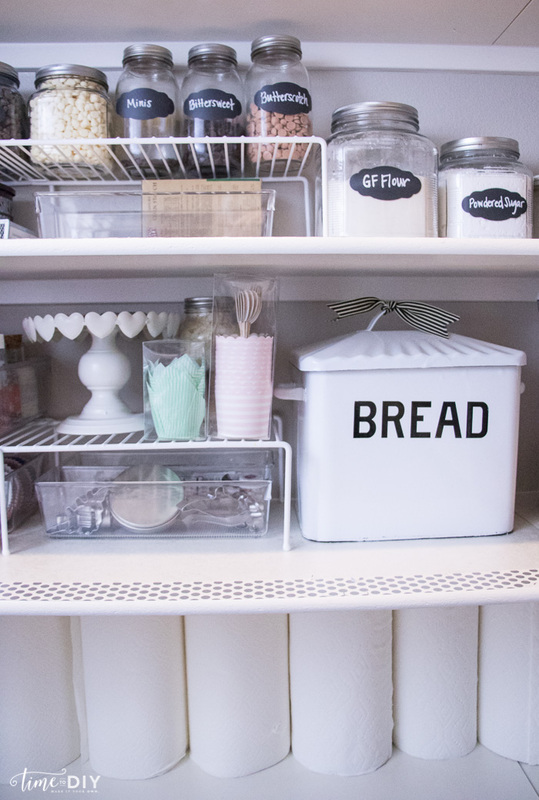 Here’s why: In my first attempt, I stenciled labels that I loved, but then sometimes I would need to change the jar contents and that just drove me nuts. 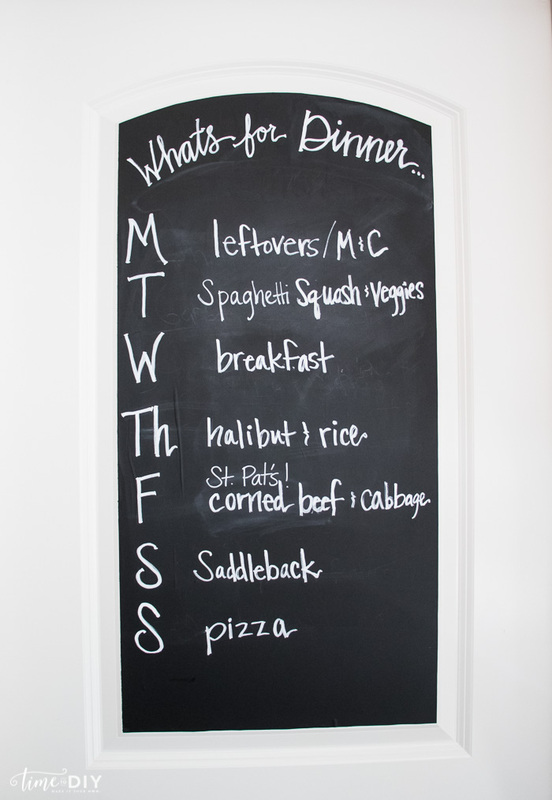 So, chalkboard is the way to go if you want flexibility, and I got mine at The Container Store. 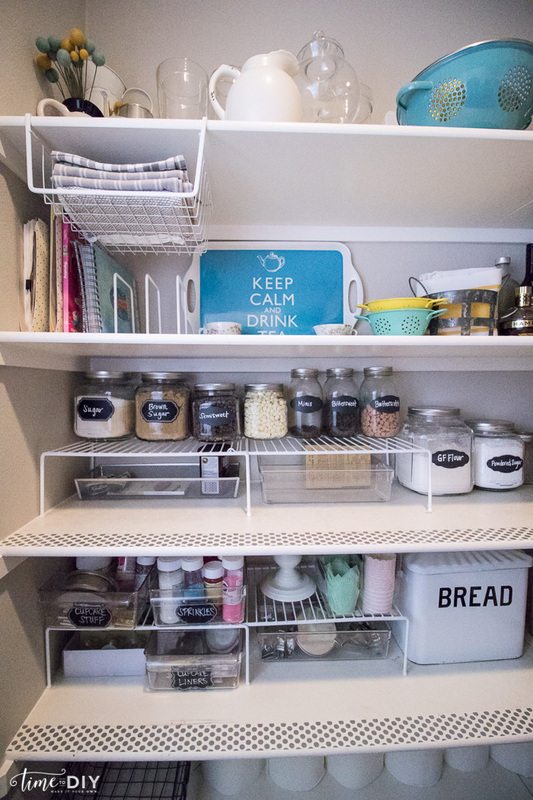 I love using expandable shelves to get more out of the space. 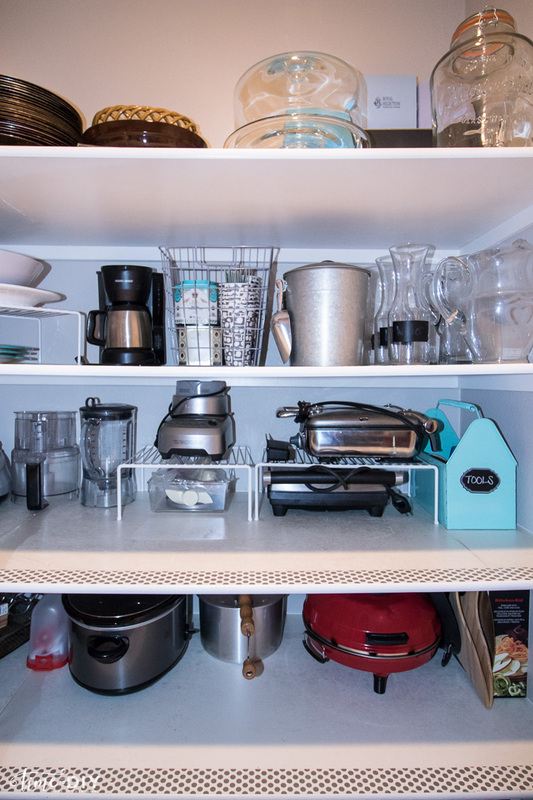 Even if I don’t have anything under the shelf, it’s nice to have a just-in-case space. And lazy susans are the best! 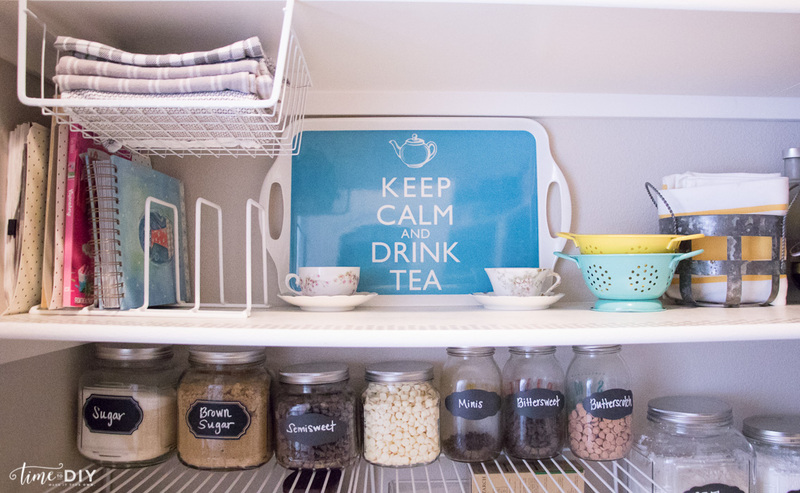 I use them in my pantry and my kitchen cabinets. 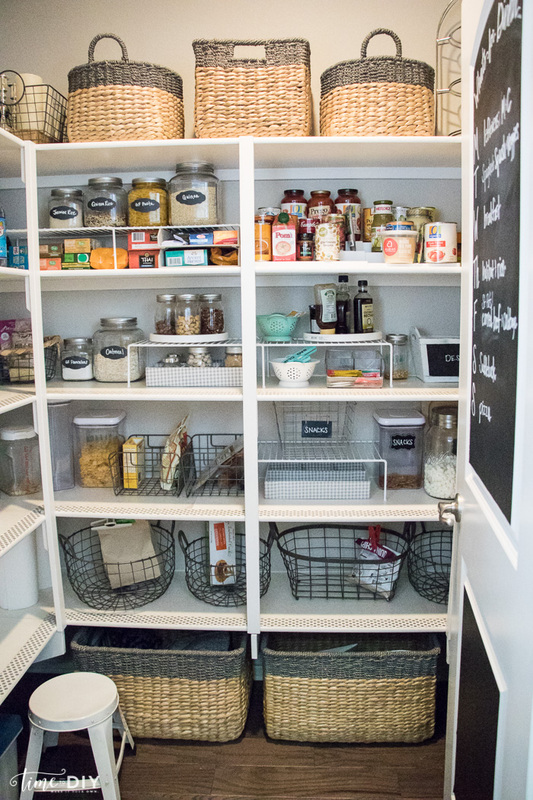 And this 3-tiered expandable shelf is great for canned goods and jars. 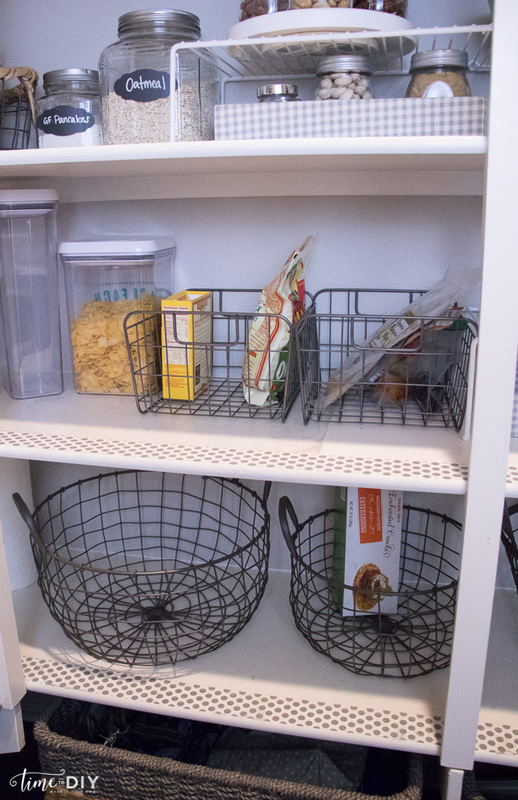 And you can even get storage here with this great under the shelf wire basket! 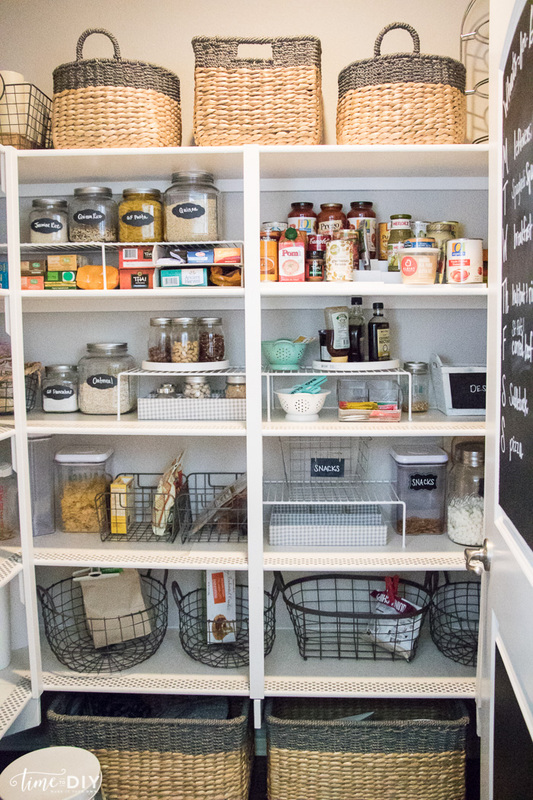 There is something so calming about an organized pantry, do you think? And here is my other section with appliances and drink stuff. 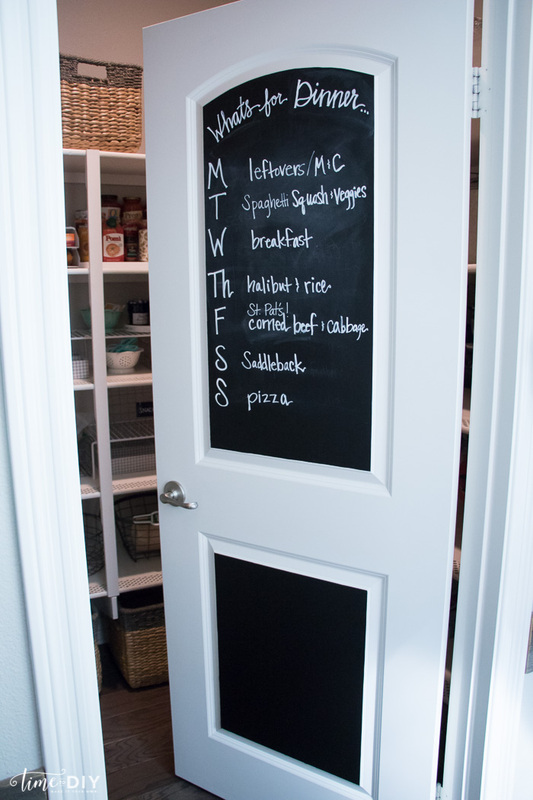 And to utilize the space ever more, I used chalkboard adhesive on the door to list out our weekly dinner menu. This project was a year in the making, but I’m happy I finally got it right! Anchor Hocking Glass Cracker Jars – set of three (Container Store) – these are currently on sale! 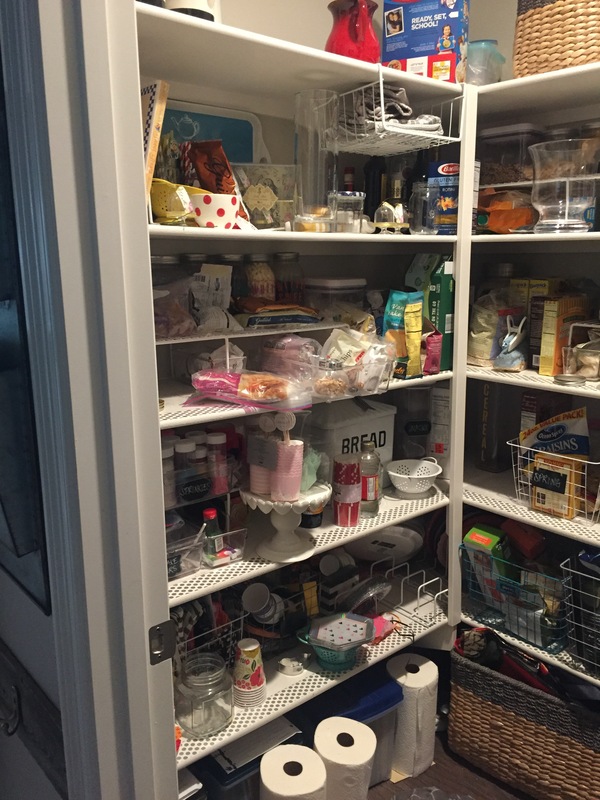 Deep Fridge Binz – 3 sizes (Container Store) – these are currently on sale! *Some affiliate links are used, but all opinions are my own. So much I LOVE about all of this! Thanks for all the great ideas!